We have a special treat for you this week courtesy of Daytona Homes. This company specializes in building family homes in Edmonton. 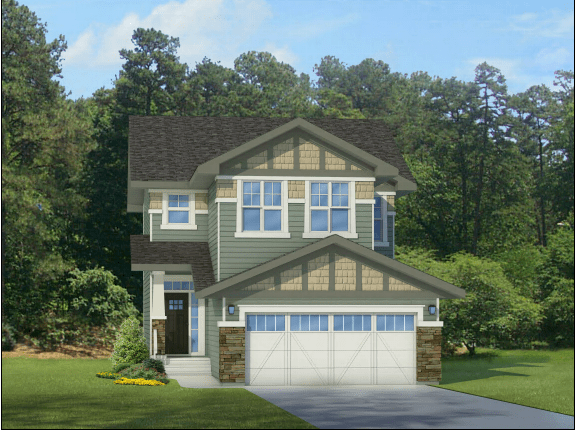 We will be featuring the “Austyn 3” this is a popular design among residents in the community of Stewart Greens. This home provides a great benchmark for the type of home you can expect when you choose to buy a home in Stewart greens. The Austyn III (2,000 sq. ft.) is a beautiful two-story design available in Craftsman, Prairie, and Tudor designs. With 3 bedrooms and 2.5 bathrooms, this beautiful home welcomes you with an inviting foyer that leads into an incredibly spacious home. The modern kitchen opens up to a large great room complete with an amazing fireplace. Nearby is a comfortable nook surrounded with windows to allow natural light to pour in while dining. This makes it easy to enjoy any season. The walk-thru pantry has space for a future bar fridge and wine rack and leads through to the mudroom and attached double garage. Upstairs is open to below and features a versatile bonus room, 2 bedrooms, a half bath, and an upstairs laundry for added convenience. The master bedroom is complete with a walk-in closet and ensuite. Optional basement development is also available. You are looking at the perfect family home in the Austyn 3. The design is simple yet beautiful, it is designed to accommodate a growing family and it is equipped with more than enough garage space and storage. This home is also situated in the perfect neighbourhood, you would in close proximity to other families. Being that close makes scheduling play dates and meeting new friends very likely and easy. West Edmonton is also a hub for greenspace. West Edmonton is full of things to do in every season so getting the kids outside is not going to be an issue.